The first day of the month is the Kalends, sacred to Juno. The Nones falls on the 5th and the Ides, sacred to Jupiter, falls on the 13th. The 2nd, 6th and 14th are unlucky (ater). Though kind Venus sets her hand there and claims it. And maintains all beings from her source. And taught them each to associate with a partner. Now the vine bursts in buds through the swollen bark. Her native seas, and fear the winter’s threat no longer. Such are the heights of wickedness to which men are driven by superstition. terriloquis victus dictis desciscere quaeres. Readers of this blog are probably aware that the Latin religio does not mean "religion" in the modern sense, but rather something more like "duty" or "obligation", the recognition of the relationship that people have with the gods. (I am aware of the other, technical, sense that specialist Romans used, that of "violation", but that does not apply here.) What Lucretius is objecting to is the risk that one's sense of religio can be manipulated by "soothsayer's terror-tales", "blood-curdling declaration of the prophets", "terriloquis ... dictis" to create fear (timor). In other words, exactly the feeling of superstitio that is anathema to the true Roman Cultus Deorum. Through his Epicurean philosophy, Lucretius proposes an approach that makes the pietas of ordinary Romans immune to superstitio. It is possible that Latham, in choosing the word "superstition" in place of Leonard's "Religion", had this distinction in mind. Understanding this, we can see that Lucretius was not "against religion" and there is no conflict in his dedicating his book to Venus. The inspiration of Venus (and Lucretius) is not confined to the Roman period. 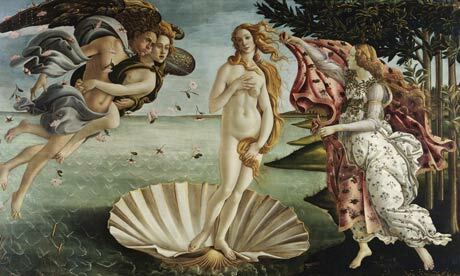 Jonathan Jones of the Guardian has written about how Sandro Botticelli was inspired to paint The Birth of Venus after reading Lucretius. He says, "The power of Botticelli's painting is that it brings an ancient religion back to life. To love this image is to worship the ancient Roman gods. Hail Venus!" Replacing their acorns with more nourishing food. So the deep-ploughed soil first saw the light. Ah! If only it could have been hidden forever. Pray for endless peace and a peace-loving leader. Ceres is pleased with little, if it’s pure in kind. Fordicidia: April 15. In honour of Tellus. Parilia: April 21. In honour of Pales. Vinalia urbana: April 23. In honour of Venus and the previous year's wine harvest. Robigalia: April 25. In honour of Robigus, with foot races. Floralia: April 28 to May 1. (Ludi Florales), games in honor of Flora. In many parts of the northern hemisphere it is the beginning of the gardening season, and so it is a fitting time to recognize the generative power of Venus. There is a translation of Cato's ritual for digging land here. I am not suggesting that every gardener needs to sacrifice a pig. On the contrary, you should feel free to adapt the rituals, and the exact dates, to suit your own situation. Look on our "Ritual" page (see the menu near the top of this blog) for guidelines on conducting your own ritual, including comments on the bloodless "Numa Tradition". I invite you to add your ideas for April in the comments. I also welcome submission of photos to help us share what we do and how we do it. Finally, we will also be discussing this on the Facebook group. 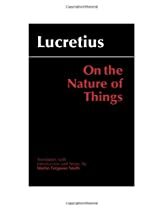 Note: The introduction to "Lucretius: On the Nature of Things" translated by M.F. Smith is available online by permission of Hackett Publishing Company.